EPL title race.. Capital One cup final.. lots to look foward to. Late post today, blinding headache this morning. Sleep late every night.. Wake up tired.. Complain.. Repeat the next day, story of my life. The EPL is back today, this season has been one with a lot of surprises and disappointments in equal share, great goals and even better saves. With 11 matches left to be played and just 4 points separating the top 4 teams, the run-in of this season could well be one of the most excited in a while. Chelsea, the table toppers travel to Craven Cottage to be hosted by a floundering Fulham team who sit rock bottom. Chelsea took 3 points in the corresponding fixture and are expected to do same today, maintain their top spot and move further away from Manchester City who won’t have any EPL game today. They’ll be looking to an in-form Hazard for inspiration. 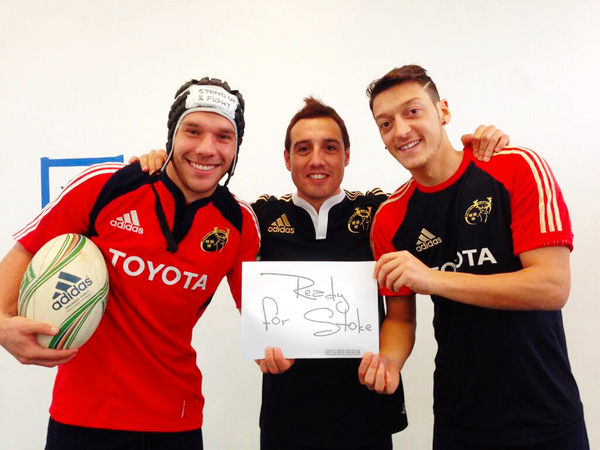 Arsenal travel to Stoke City, a place that has been a thorn in their flesh in recent years. Arsene will be going with a refreshed team after he rested some players in last weeks game against Sunderland and all players were given a 2 day break during the week. A group of Stoke fans are planning a minutes silence on the 67th minute to spite Aaron Ramsey’s leg break which is just a senseless gesture, exactly the type of thing you’d expect from an anti-football team. Ozil might be in the team today and Arsenal fans will want to see a hungry in-form player. Manchester city play Sunderland in the final of the Capital One cup. After last seasons final loss in this same cup final to Wigan, Pellegrini will want to make amends. Aguero faces a late fitness test and could be in the team today. Sunderland will draw hope from their win against City back in November and Poyet’s men will be looking to achieve what could arguably be the biggest upset of the season. In the Bundesliga, Bayern Munich host Shalke 04 and Borussia Dortmund host Nurnberg in what should be a straightforward win for both home teams. That’ll be all for now… Need to let sleep work it’s magical powers of recovery. What are your thoughts on today’s game? ?